Circle August 8 on your calendar and remember this game against the Cincinnati Reds, especially if the Cardinals grab one of the two wild card spots by just one game. The Cardinals scored five runs in the ninth inning to pull out a wild 5-4 win over the Reds. 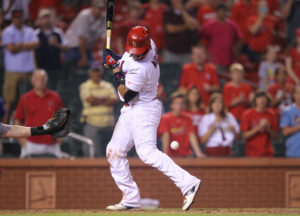 St. Louis scored the winning run when Yadier Molina was hit by a pitch with the bases loaded. St. Louis looked lifeless. Fans on Twitter were calling for Mike Matheny’s job. The Cardinals had just five hits and were 0-for-11 with RISP. Matt Carpenter singled in two with the bases loaded, Stephen Piscotty made it a one-run game with a single, and a bases-loaded walk by Brandon Moss tied the game at 4. Reds reliever Ross Ohlendorf entered for closer Tony Cingrani, and hit Yadier Molina two pitches later, the Cardinals celebrated their sixth walk-off victory of the season.